Building on the blog post that I was posted earlier today regarding the animation feature within Blender, I decided that I would attempt to create an animation within it. The animation that I was able to make is located at the bottom of the page. Although it is quite short, I am quite proud of it, due to the fact that to create it I had to manipulate the particle system within Blender, and that was not something that I had done before. 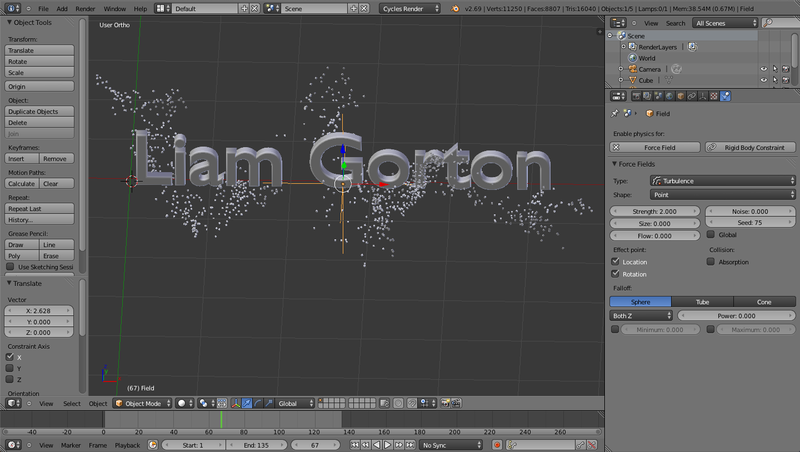 In retrospect it was quite easy as Blender allows you to completely control how many particles there will be and when they will be introduced, so once that is completed it is simply about when the actual block text should disappear, and that is done through key frames. I am planning on using what I have been able to create here in the animation that I am going to. This is because I feel that putting this effect at the end of video to make the logo disappear will add another dimension to my animation. This is because at the moment the idea I have for the animation is that the logo be facing backwards and then rotate to face the camera and at the same time I would be moving the camera to add a sense of dynamism. However adding this effect at the end maybe the perfect way of ending the animation.